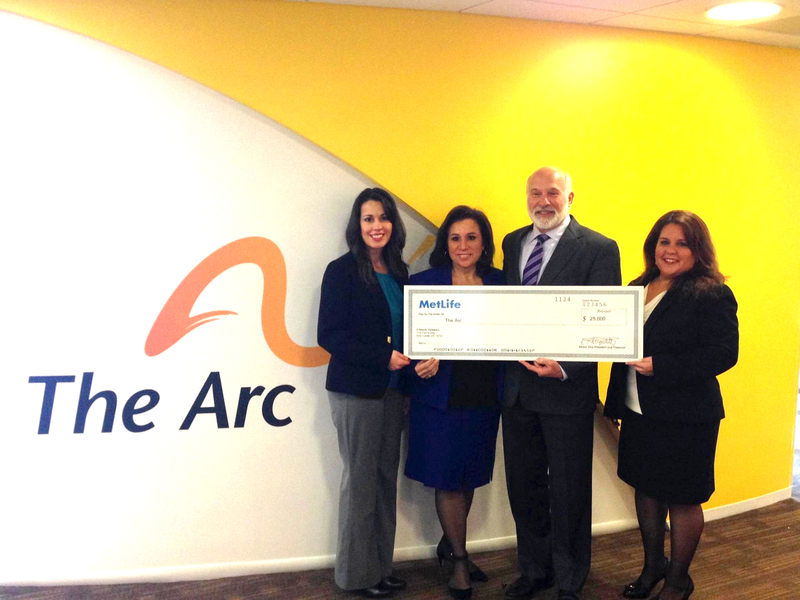 This week, The Arc was presented a check for $25,000 from the MetLife Foundation. In December, The Arc was chosen as the beneficiary of a social media campaign MetLife was conducting in conjunction with its MetLife Center for Special Needs Planning. For one day, MetLife donated $1 for each “like” of a post about The Arc and $2 for each comment (the cap for donations was $25,000). The response was overwhelming with more than 38,000 “likes” and 2,000 comments. This was the highest response MetLife has ever received with a social media campaign. “On December 17, we partnered with MetLife and raised $25,000 for The Arc to help individuals with intellectual and developmental disabilities and their families. The overwhelming response of our followers online highlighted how strong our movement is. Support of organizations like MetLife enable us to continue our work to promote inclusion and civil rights for individuals with intellectual and developmental disabilities, and we thank them their generous support,” said Peter Berns, CEO of The Arc. “It’s rewarding to be able to give to an organization that helps the families we serve. And what better time than the season for giving,” said Kelly Piacenti, Assistant Vice President, MetLife Center for Special Needs Planning. This entry was posted in Press Releases and tagged donation, giving, MetLife, MetLife Foundation. Bookmark the permalink. I’m a little unclear about what type of help you give to people with intellectual disability and their families. A good place to start would be the What We Do page on our website, which is at http://www.thearc.org/what-we-do.